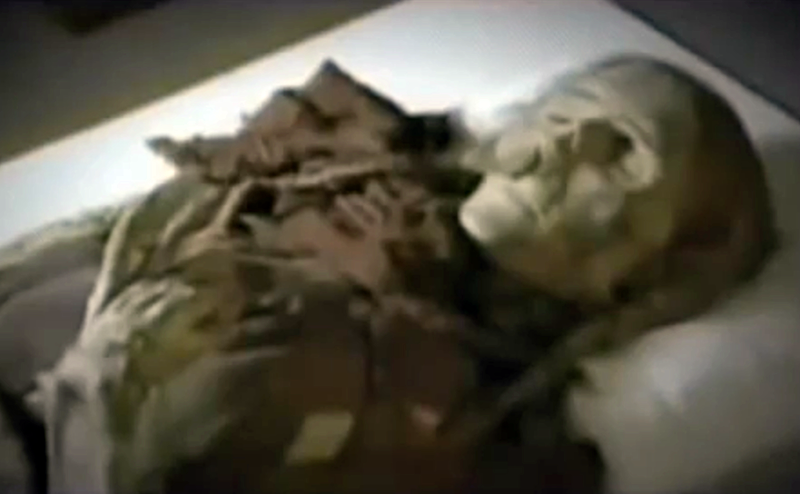 UFO SIGHTINGS DAILY: 800 Million Year Old Woman Found And Looks Just decades Old, Sept 1969, Video, UFO Sighting News. 800 Million Year Old Woman Found And Looks Just decades Old, Sept 1969, Video, UFO Sighting News. I imagine the Russian scientist that studied this woman is probably still alive. This was an alien woman, and she was preserved inside a stone-like capsule with a liquid inside, the liquid would have been studied, and eventually found to be regenerating. Although it didn't bring the woman back from death, it kept her looking young. Therefore the scientist probably found this out, hid the info about it, and kept it for himself. He is probably still alive and well today somewhere using this liquid every so often to become younger. Alien technology could keep us young forever. TRANSLATION FROM RUSSIAN: In September 1969, at the village of Rzhavchik Tisulskago in the Kemerovo region, a very strange burial was discovered. She was dressed in a white lace transparent dress length just below the knee. The short sleeves were embroidered with colorful flowers. Underwear was absent. It seemed that she was not dead, but sleeping. At her head was a black, rectangular metal box, rounded at one end (something like a cell phone), of approximately 25 to 10 cm in size. However, in less than 24 hours the mysterious finding was reported in the district centre. The fire brigade, the military, and militia all confirmed the discovery. By 2 pm that day, a brick-red helicopter landed and the place was declared contagious and onlookers pushed away. Then the authorities sealed off the place and quarantined all who touched the coffin, even those who had been standing near.